Matt Yglesias, boy genius and resident economics expert at Ezra Klein’s Vox.com, recently posted the following banality under the title “The Private Sector is Up, the Public Sector is Down”. The recession hit the private sector faster and harder, but the private sector’s already made back all its losses. The government, by contrast, has been really slumping. ProTip: Whenever Matt makes a pronouncement like that, it pays to dig a mite deeper. So I did. I went to the same source that Matt used, FRED, an online compendium of economic data plus a graphing tool courtesy of the Federal Reserve Bank of St. Louis. This is what I found. 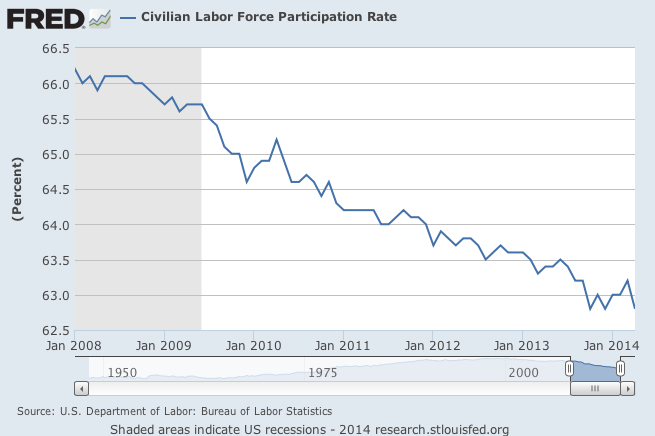 The labor force is made up of about 116 million workers in the private sector, and about 22 million in “government”. Now, when Matt refers to “the government” in the quote above, he conveys the impression that there must’ve been some real belt-tightening in the Federal workforce. As it turns out, excluding postal workers, fewer than 10% of workers in “Government” are in Federal, non-Postal Service jobs. 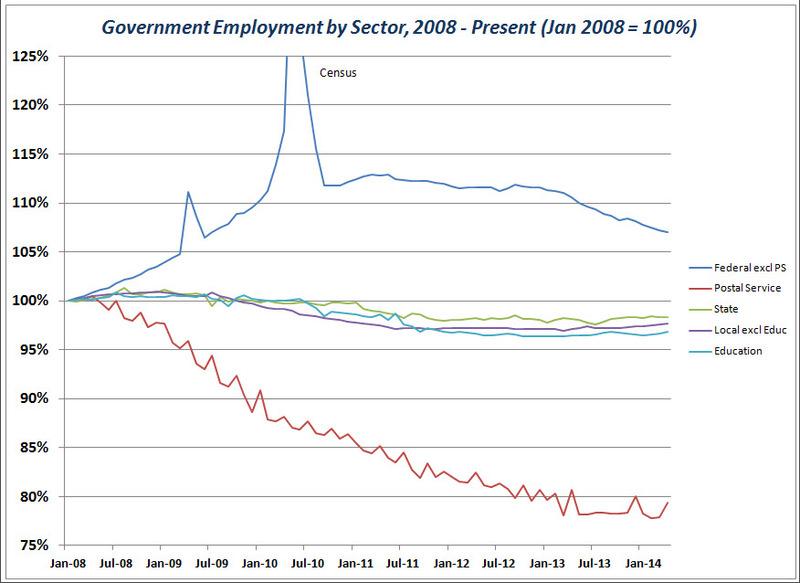 What happens if we break Matt’s “Government” line out by sector? Wow. That graph gives quite a different impression, doesn’t it? Matt’s analysis completely masks the fact that in the Federal government, excluding the Postal Service, employment is actually up by 138,000 total jobs compared to the start of the recession! At its non-Census peak, it was up almost 12%. The Federal graph looks like an anaconda after eating a pig. At the other extreme, the Postal Service steadily lost jobs, down by 155,000, or over 20%. The other large numbers of losses are in Education (down 255,000 jobs, about 3%) and Local Government excluding Education (down 148,000 jobs, or 2.5%). So a more insightful analysis of the situation would be to observe that most of the “really slumping” that government workers have absorbed has come in the state and local sectors that are required to balance their budgets. The Postal Service is also run more like a business, at least in the sense that its managers must deal with loss of market share by restructuring the organization. 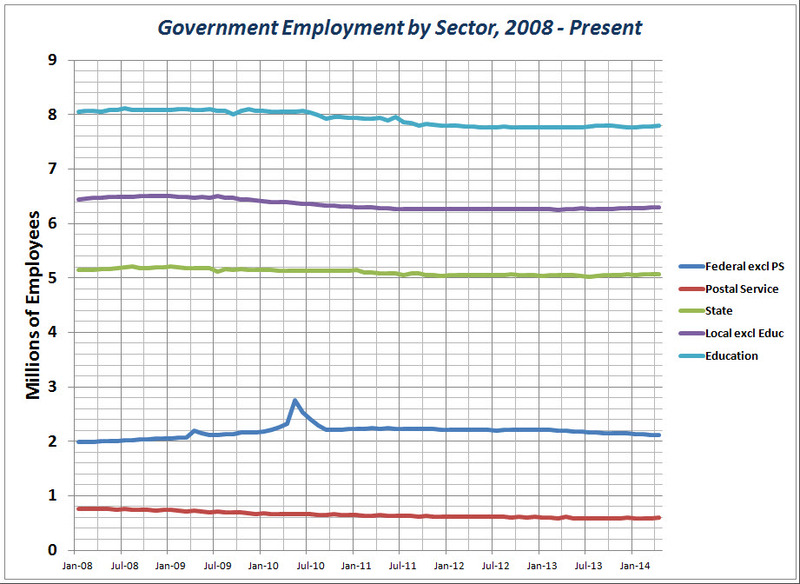 It is also interesting to note that the big losses of government jobs have come in the more heavily unionized sectors. If we look at a non-indexed graph of raw employment numbers we get a truer picture of what’s really happening. Indexing the graph tends to amplify the gains/losses in the smaller sectors. Over the selected time frame, “all government workers” made up a fairly stable share of the workforce, ranging from 15.8% to 16.2%. 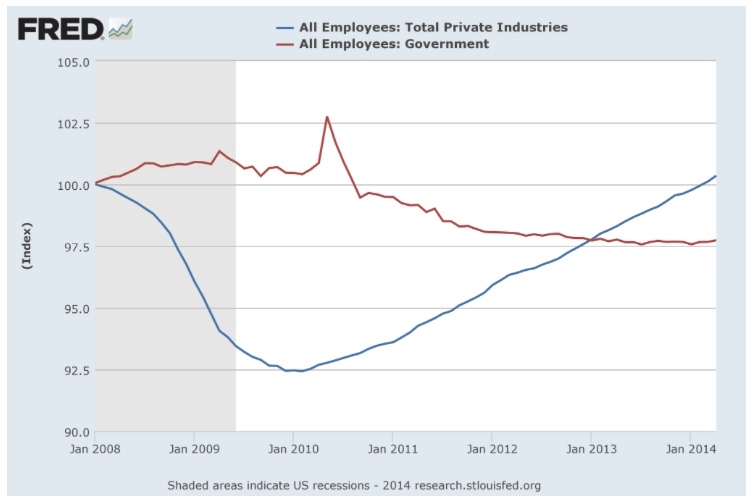 Another important point: Government jobs are not a prosperity engine for the economy. (This may come as a shock to readers who may be Democrats.) Even though Matt thinks that private sector employment has rebounded to pre-recession levels, it has yet to make up for growth in the population over the last six years. Y’know, Matt, the numbers are all there, man. Can you find a modicum of intellectual curiosity and intellectual honesty to drill down for the truth next time? (Rhetorical question.) You just might find that a true analysis conflicts with your deeply held beliefs. This entry was posted in Economy, Government and tagged Employment, Ezra Klein, Juice Vox Media, Matt Yglesias, Vox.com. Bookmark the permalink.